The Alliance For Democracy - News, eNewsletters, Alerts and Chapter News: Who's endorsing what in the California elections? Who's endorsing what in the California elections? 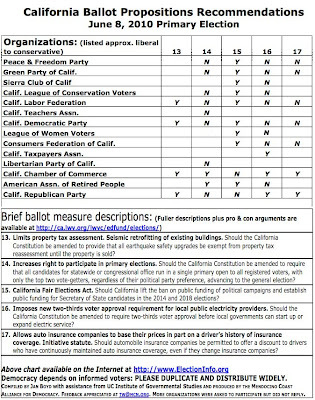 As a public service for voters in the upcoming election, the non-partisan, non-profit organization Alliance for Democracy, with the assistance of the UC Institute of Governmental Studies, compiled the ballot recommendation chart below. We encourages you to publish it in your publication since it helps create better informed voters and increases voter participation. If you have questions or comments, please contact me at tw@mcn.org. The chart below lists how 14 major non-profit organizations recommend citizens to vote in the upcoming primary election, June 8, 2010. The participants run the political spectrum from progressive, at the top of the list, to conservative, at the bottom. For the first time, all nine left/liberal orgs agree on all five propositions-- Yes, No, Yes, No, No-- while the conservative orgs do not agree. This chart was compiled by Caspar's Jan Boyd with the assistance of the UC Institute of Governmental Studies and produced by the Mendocino Coast Alliance for Democracy. It is available and will be updated on the website www.ElectionInfo.org as additional ballot recommendations are submitted. 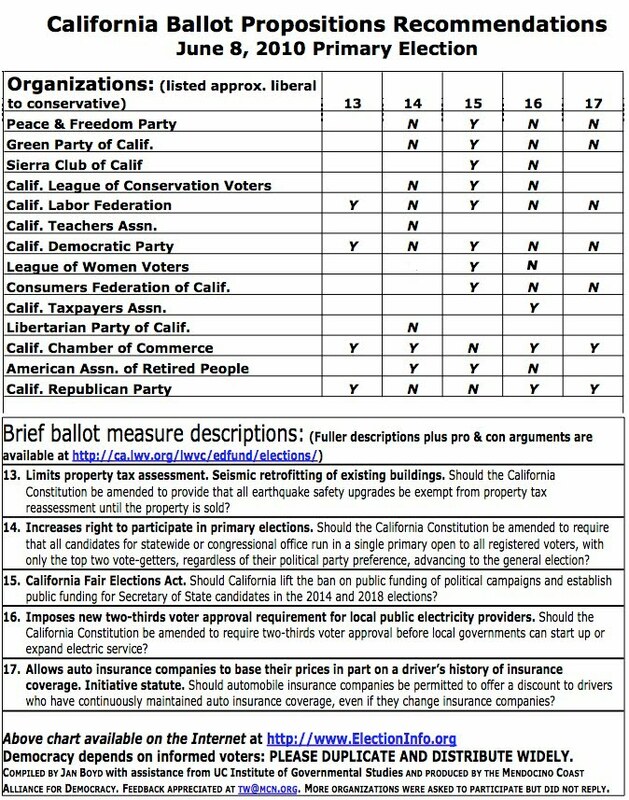 Note that the original chart incorrectly listed two recommendations by the CA LWV: they have no position on Question 14, recommend a Yes on 15, and a No on 16. You can read more from the League here. The corrected chart is below.